Chapterwise Comprehensive Algae Fuels Report. 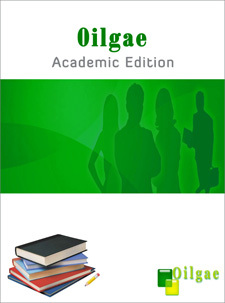 As a student or researcher, if you wish to explore this promising area, The Oilgae Report Academic Edition is an indispensable guide for you. The Oilgae team would like to talk to you to understand how we can help you in your algae fuel efforts. If you are interested in purchasing the report or getting our help, talk to us now. Algae, a third-generation biofuel feedstock, present one of the most exciting possibilities as a future solution to our energy problems, especially that of transportation fuel. In the last few years, activity in this field has been accelerating fast. Algae oil industry is in a stage of its lifecycle where the amount and quality of relevant scientific expertise is the need of the hour. The real challenges facing the industry now (and for the next 3-5 years) are scientific in nature; hence, fundamental and applied research expertise is the most critical requirements for the industry. This has motivated many prestigious universities and colleges all over the world to undertake algae fuel research in full earnest. Why is research in algae fuels exciting? Algae present an exciting opportunity for researchers owing to their diverse applications and its potential to be a major source of biofuels. Algae are already being used in a wide variety of industries and applications, and many newer applications are being discovered. Such a wide range of end-uses enable companies to produce both fuels and non-fuel products from the same algae feedstock. Algae research provides an environmentally friendly solution for serious global threats like greenhouse gas emissions. The bioremediation potential from algae makes it possible to use algae for cost effective CO2 sequestration and wastewater treatment. The Oilgae Report Academic Edition was developed to provide research insights on new methodologies, perspectives and experiments on how best to derive energy from algae. This report is a customized edition for academic and industry researchers, and students. The report highlights research efforts having a focus on biofuels and bio-energy. It presents numerous case studies and examples of what the pioneers are doing in the algae energy domain. It showcases case studies on algae research efforts in areas such as waste water treatment, CO2 sequestration at power plants. It lists algae culture centers, from where students and researchers can obtain algae strains. It provides current and future research areas in algae energy domain. It provides details, for researchers, on pathways and technologies for alternative energy products not just biodiesel - from algae. It has a specific emphasis on patents and research papers that have been published in this domain. 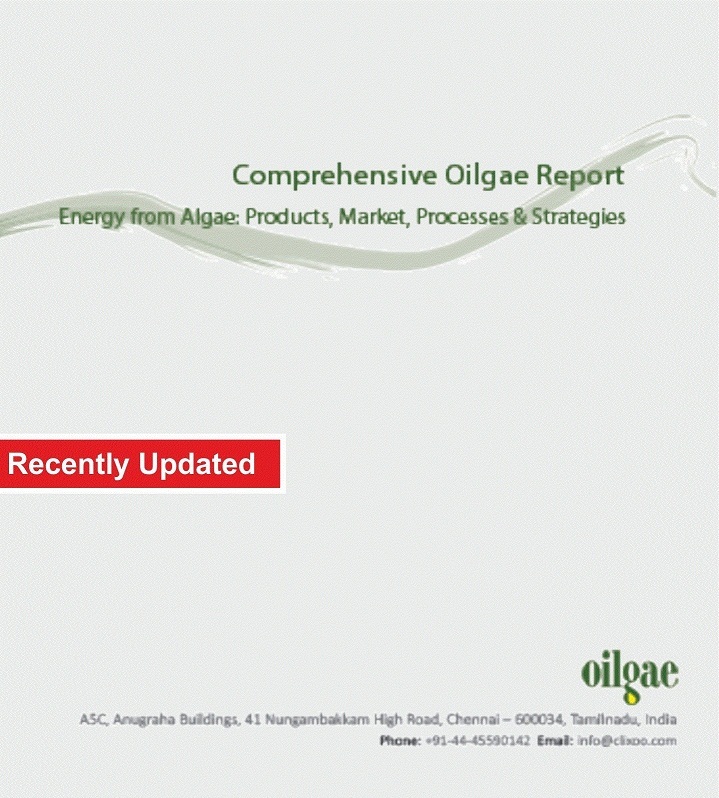 The goal of the Oilgae Report Academic Edition is to present an objective research report on the algae fuels industry. Written by professionals who have been observing the industry since its inception and have been interacting continuously with all the key research people and industry players, this report will assist you to explore an exciting research domain - algae energy. The price of the report is US$ 250. Within 24 hours of receiving your payment, we will send the Oilgae Report Academic Edition as a PDF to the email address you provided while paying. Have any Questions in Report / Payment Problems ? Determining the Optimal "Energy Product"
Which is Better - Microalgae or Macroalgae? How often should the PBR be cleaned? What are the major parts of a PBR, and what are the parts that make it costly? At which stage of wastewater treatment are algae is introduced? As sewage already contains nutrient, is there any need for additional nutrients for algae cultivation in sewage? Are there algae predators in sewage? Will toxins affect algae growth in sewage? Which is the best algae harvesting method for sewage cultivation? What are the natural microfloras in sewage? What will be the source of water in desert region? Is it possible to use water in closed loop? How can the problem of evaporation be overcome? Do the nutrients in seawater serve as natural nutrients for algae growth? What are the challenges for marine algae cultivation? How do the constituents other than CO2 in flue gas from power plants affect algal growth? Can algae withstand the high temperatures in the flue gases? What is amount of CO2 required for algae growth? Why isn't Algal Biodiesel Currently Produced on a Large-scale? 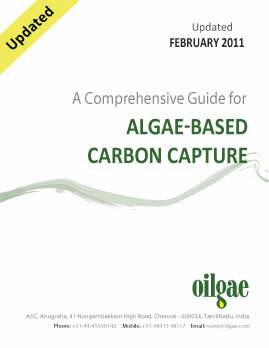 About OilgaeOilgae is the premier resource for the global algae energy industry. Started in 2006 with a dedicated focus on algae energy, Oilgae today serves as a crucial platform and opinion-leader for this industry. The Oilgae team is frequently interviewed by leading world media and frequently presents at seminars and conferences. Some of the media that Oilgae has been mentioned in are: WorldChanging (Columbia University), BBC, Salon Magazine, Los Angeles Times, New York Times, Wired, India Times and more. Oilgae today is so synonymous with algae energy that many people worldwide use Oilgae as the word to refer to oil from algae! 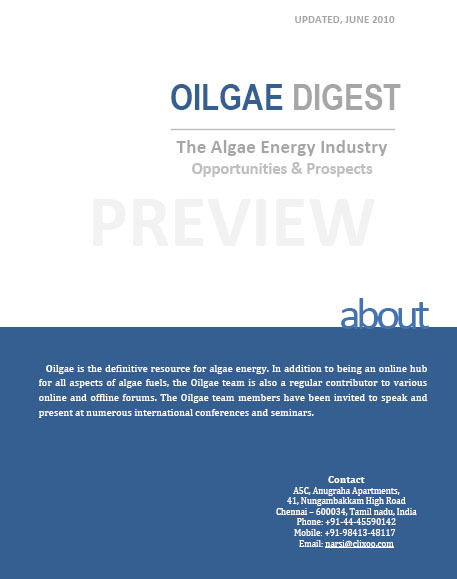 The Oilgae Digest provides insights on the key parameters driving the algae fuel business - technical and economic feasibility, real industry status, investments and costs, and business success factors. A detailed report on all aspects of the algae fuel value chain, the Comprehensive Algae Fuels Report will be of immense help to those who are on the threshold of investing in algae biofuels. Compiled by a diverse team of experts, with experience in scientific and industrial fields, the Comprehensive Report for Wastewater Treatment Using Algae is the first report that provides in-depth analysis and insights on this important field.